Last Sunday the LA Galaxy won the MLS Cup, defeating the Houston Dynamo by a score of 1-0. The result was expected, as the Galaxy had been the best team in the league all season. Actually, it could be argued that they’ve been the best team over the last three years… but they had not yet won the MLS Cup, so they seemed to be particularly focused. This comment seems apropos of Landon Donovan’s entire career. No matter what he accomplishes, people don’t seem to think that it’s quite enough. I don’t need to go into all of his accolades here, but to provide a thumbnail sketch: he was voted the best player participating in the u17 world cup. He was voted the best young player in the 2002 world cup. He’s the all-time leader in both goals and assists for the US Men’s National team (by a wide margin). He’s played in three world cup finals, and been a major contributor in all three. Playing for his club, he’s won four MLS Cup trophies with two different teams and he’s the all-time leading playoff goal-scorer in MLS (with 20 goals). He won two championships as a young gun providing attacking spark for the San Jose Earthquakes in the early 2000s. He carried a mediocre LA Galaxy team to both US Open Cup and MLS Cup championships in 2005. This year he captained the Galaxy (a team that boasts two players that have captained their respective national teams – Beckham and Keane) to the best record in the league, and capped it off with another MLS Cup medal. No other field player in US history has a resume that even comes close to this. So why, when you bring up Donovan around a group of die-hard soccer fans do you hear him called soft, inconsistent, and over-rated? Why does he have the pejorative nickname “Landycakes”? Why is he criticized by the press with comments such as this? There are a couple of reason’s that Donovan is an easy target. The first is that he has had failures in his career. He originally signed a contract to play for top German squad Bayer Leverkusen as a sixteen year-old. After failing to get playing time, he came to the MLS on a loan to play for the San Jose Earthquakes, citing general unhappiness and a desire to be closer to home. Following his successful 2002 World Cup appearance, Leverkusen recalled Donovan, but he was only there for a couple of months before asking to be released after a horrendous Champions’ League performance against Liverpool. He was seen as coming back to MLS with his tail between his legs. In 2009 Donovan took a third crack at Germany, this time with Bayern Munich, and while scoring five goals in exhibition matches, he failed to earn much playing time in competitive play in the short loan, and was seen as failing yet again. His performance in the 2006 World Cup finals was also seen as a major failure. After the stellar performance in 2002, Bruce Arena built the 2006 team around Donovan as an attacking midfielder. While Landon lead the team in scoring and assists through qualifying, he made little impact at the world cup finals, and the team was eliminated in the first round. He was particularly criticized for not being aggressive enough, and deferring to less skilled (if older) teammates at key times in matches. Even in MLS, Donovan has seen some rough patches. In 2009 he lead the LA Galaxy to the MLS Cup final, and had the opportunity to take a penalty kick in the shootout that would have won the championship. He missed badly, allowing the opportunity to slip away, and once again, many questioned his mental toughness. In short, Donovan gives his critics a lot of ammunition giving shaded, thoughtful answers to tough questions, and even admitting his weaknesses in public forums. In the macho world of professional sports, that’s seen as soft. In the world of professional sports, all athletes face setbacks and failures. The thing that works against Donovan is that a) his sublime skills lead to abnormally high expectations; and b) he openly talks about his failures. Every time he fails to meet those expectations, someone comments on it. After last Sunday’s championship match, he was criticized in some corners for not doing enough. Scoring the winning goal and leading the team in shots doesn’t do the trick. He needs to do EVRYTHING, or he hasn’t lived up to his capabilities. Failure in Europe? In 2010 he had a loan spell with Everton in the EPL and won the player-of-the month award for his outstanding performances against the top four teams in the league. Failure in the World Cup? In 2010 he looked like a man on a mission, leading the USMNT to win it’s group and scoring the iconic goal at the end of the game against Algeria that allowed it to happen. Missed PK in the 2009 MLS Cup shootout? Donovan scores the game-winning goal in the 2011 MLS Cup and wins the MVP award. Is Donovan a failure? Does he have soft spots and weaknesses? Absolutely. The thing that separates him from all the other US soccer players is that, not only does he have a stunning skillset, but he continues to work harder and harder to learn from his mistakes. You knock him down, and he gets back up and comes back at you. He just does it in a methodical and unassuming way which fools people into thinking he’s admitting defeat. Will he fail in the future? You bet. Anyone who takes on the types of challenges that he does is bound to face setbacks, and he’s not done yet. So I don’t know about all the other fans of the USMNT and/or the LA Galaxy, but as Donovan heads into the final phase of his illustrious career, I’m going to sit back and enjoy watching him play the game. I’m going to marvel at his remarkable touch, vision, and composure. I’m going to get a kick out of every one of those patented recovery runs that he makes when protecting a one-goal lead. I’ll watch with regret as his speed and quickness begin to fade, and I’ll yell at him on the television when he makes a poor play. However, I won’t let my expectations get in the way of appreciating what he brings to the game, and I will not question his standing as the best field player the United States has ever produced. After all, if I do that, I’m simply depriving myself of the joy of watching a master at work. As a grad student, he was pretty careful about telling people about his “alter ego.” He wanted to be taken seriously as an academic. Eventually his band (Vehicle Flips) ended up playing at Penn State, and I got a chance to check them out. I really like Frank’s music, and have ended up doing a couple of covers. This is one. The other day I was talking to a friend about how depressing it is to read the news. The world really is crazy. People lose sight of what they are trying to achieve and end up fighting amongst themselves about the means, rather than the goal. In the end everyone undermines everyone else until very little is actually accomplished. I made the video below a few years ago. I had given our youngest son (Taran) the camera to play with, and our neighbor came over and we ended up sitting on the porch talking about politics and life while Taran wandered around us playing with the camera, capturing bits and pieces of the conversation while exploring his own little space. The Tears for Fears song seemed appropriate to mix in that footage. Tonight was the last farmers of 2011 in Pendleton. The farmers market has become a real institution over the past few years. There’s a small dedicated group of people who put a lot of time and effort into attracting vendors, musicians, and other folks to keep it fresh and exciting. I usually play there a couple of times every summer, but this year I’ve been playing with a great guy I met at the Pendleton Open Mic named Jared Pennington. Jared is an outstanding guitarist. We don’t really rehearse at all (at this point), we just get together and play. I play songs I know and he improvises. It’s a lot of fun for me, and he seems to have a decent time as well. Tonight we were scheduled to play the market, but when we got down there we found that they’d double-booked, and another local musician (J.D. Kindle – who’s album, Campfire Pop Abstraction, is GREAT) thought he was setting up in the same place that Jared and I were. Turns out, they were setting up an end-of-season party a block down with Great Pacific (the local institution for wine, coffee, and decent food) setting up a beer garden. Jared and I setup down there and played from a little after 5:00 to about 8:30, and a had a great time with a lively crowd. It was a great way to wrap up another season of farmers markets! I just spent several days at the North American Cartographic Information Society 2011 meeting in Madison, WI, so I’m sorta geeking out on cartography and geography right now. It was an awesome conference, and reminded me why I love cartography and geography. On the flight out I actually worked on a talk I gave on Monday, but on the way home I was able to spend some time looking out the window of the plane (which is one of my favorite activities). I love checking out landforms, and got some kinda cool pictures, including these of the Cascades and Central Washington. The picture to the right is a coulee that was formed in the Missoula Floods at the end of the last ice age. It’s amazing to see these formations from the air, where the scale of the processes that created them are evident. Below is a picture of the White Bluffs on the Columbia River. This area is the northern boundary of the lands that the Umatilla Tribes ceded to the US Federal Government in the treaty of 1855. The area south of the bluffs is the Hanford Nuclear Reservation, which houses several mothballed nuclear facilities employed for the creation of atomic weapons (one of which is evident in the lower left-hand corner of the photo). There are more of these photos, as well as others I’ve taken over the past through years in the photo gallery of this site. I just left the North American Cartographic Information Society 2011 conference this evening. I’ve been to A LOT of conferences over the years, and I’ve got to admit that I often have trouble sitting through sessions. It’s not that the content or presentations are necessarily bad… it’s just that I’ve never been good at sitting still and focusing on something that I wasn’t actively involved in. This particular conference, however, was great! I’m sure that it, at least partially, had something to do with my state of mind, and the fact that I had some really specific things I was looking to get out of it… but it also had something to do with the fact that the people there are SO NICE, and the organizers made a concerted effort to create a welcoming atmosphere. Madison from my hotel room window. On a more personal note, It also helped that a lot of people who I consider to be friends were attending, it was held in Madison, the weather was pretty nice (at least part of the time), and I had my guitar, so I could sneak up to my room and play a song now and then. Saturday Oct 8, 7:00 pm @ Mugby Junction Cafe – 421 Huff St. This isn’t a show… but on the following Monday I’m giving a talk on GIS at UW LaCrosse before I head over to Madison (on Tuesday) for the North American Cartographic Information Society (NACIS) conference. When I get back to Pendleton the following week, I’m playing at the Farmers Market on Friday the 21st, and the Thursday after that (October 27) there’s my favorite open mic at The Vert Little Theater. 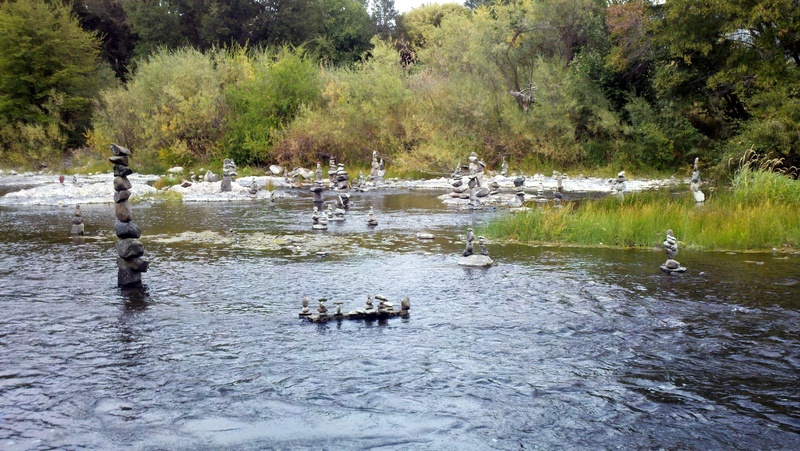 There’s a beautiful river walk here in Pendleton, Oregon that runs along the Umatilla River. Over the last week or so, as Sarah and I take our daily walk we’ve seen a guy stacking stones near a small falls in the middle of town. I’ve stopped to take pictures and video a few times, but it’s been evening, and the lighting wasn’t great. On Saturday, however, we were able to walk around noon, and got these photos and video.